A stunning vintage sapphire blue owl duette from CORO dating to the 1940's is presented for your consideration. 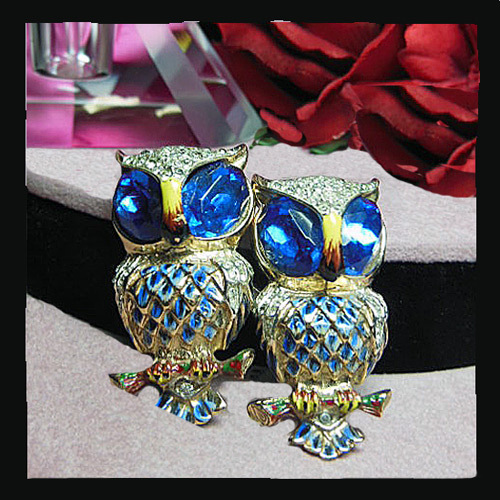 The owls, each regally perched on a branch,, have blue enamel chests with a vermeil criss-cross design, sapphire blue faceted eyes and twinkling clear pave rhinestone crowns. The duette is sterling with a beautiful gold tone over the sterling which can be appreciated when viewing the back. Both fur clips, which comprise the duette, may be removed and worn separately should one choose to do so. The clips fit into the open back of what comprises the brooch so as to allow it to be worn as seen. The owl seen at the left has the stamp which reads, CORO (in script lettering) CRAFT (smaller in size and printed) STERLING (printed under these marks) and features the PEGASUS figure to the left of the CORO CRAFT mark. Each fur clip bears the mark STERLING and the main brooch is also stamped STERLING with the Pat. No. 1798867. This treasure, measuring 2"x2", is in excellent to mint condition and if you're really wise you'll add it to your collection. Keep in mind you have a Layaway option to accommodate your schedule.